There’s a reason the Founding Fathers chose the words “life, liberty, and the pursuit of happiness” and not “life, liberty, and a measurable, high ROI.” Chip Conley knows that reason: People aspire to self-actualization. There’s a reason the Founding Fathers chose the words “life, liberty, and the pursuit of happiness” and not “life, liberty, and a measurable, high ROI.” Chip Conley knows that reason: People aspire to self-actualization. In 2001, when he was nearly broke and seeking solace, Conley wandered into a bookstore. He had been the founder of Joie de Vivre Hospitality, a Bay Area hotel company he built from nothing and had run for 15 years. The bottom had fallen out of the travel industry after the dot-com bust, taking Joie de Vivre with it; and the 9/11 attacks, a war, the SARS outbreak, and general economic weakness had also helped bring the industry and Conley’s company to their knees. That’s when he stumbled upon a copy of Abraham Maslow’s Toward a Psychology of Being. Maslow’s ideas sent Conley on a reading marathon of the business world’s legendary authors, where he discovered the extent of Maslow’s influence beyond psychology’s scholarly circles. 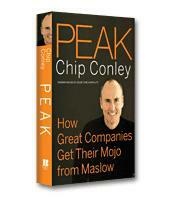 This led Conley to write Peak: How Great Companies Get Their Mojo From Maslow, and synthesized the book’s central theme: that business success comes not just from meeting people’s needs –– it comes from knowing which needs to meet. Maslow is the famed creator of the Hierarchy of Needs pyramid, which asserts that all people have certain fundamental needs and that they seek to meet those needs in a particular order. At the base of the pyramid are survival needs: food, water and sleep. The next need, a level higher, is physical safety; then comes social connections and belonging, then self-esteem. The final need –– the one that sits at the top of the pyramid and comes only after the others are met –– is self-actualization, a state in which a person is fulfilling his or her life’s calling. This last need forms Peak’s main premise: that when companies help each of their three biggest stakeholder groups (customers, employees and investors) reach that “peak” state, they create evangelizing customers; loyal and inspired employees; and passionate, long-term investors. This, in turn, creates more profitable and sustainable companies. But “peaking” means going far beyond simply meeting the basic “survival” needs of these groups. The problem is that most companies aren’t aware of the implications of Maslow’s hierarchy –– instead they focus on short-term financial performance and tangible results. So Conley’s message is largely about the functions and importance of his Maslow-inspired Relationship Truths –– three separate pyramids that represent the needs hierarchies of the three stakeholder groups. In the Employee Pyramid, companies meet employees’ “survival” needs with compensation. After this comes the need for success, a need Conley says companies meet when they consciously recognize employees. Ultimately, however, it’s the top of the pyramid — inspiration –– that makes the most difference. Employees become inspired when they believe their work is a “calling” rather than a job or a career. Fulfilling the “survival” needs on the Customer Pyramid is easy –– companies simply have to provide products and services that meet expectations. Although this is important, it doesn’t build loyalty. That only happens when companies fulfill customers’ desires, which are the emotional or intellectual needs above the tangible ones at the base of the pyramid. Customers “peak” when companies go further and meet their unrecognized needs. “Transactional alignment” is at the base of the Investor Pyramid. The need is little more than agreement between the company and its investors about the technical specifications of the investment: the rate of return, liquidity strategy, cash needs, marketing strategy and metrics. This is the basis for trust between the parties, and it lays the foundation for the second level of the pyramid: confidence. Investor confidence happens when investors feel like they’re part of the community they’ve invested in. But investors really “peak” when they sense they’re “part of something big” or are helping a cause; only then do they attain a pride of ownership that generates long-term support rather than short-term performance pressure. Few companies ascend all three of Conley’s pyramids, but the few that do are bound for greatness. Conley isn’t shy about saying the ascents are tough, but his own hell-and-back story proves that feeding the soul and feeding the pocketbook are often best done together.